It’s sponsored by Wine Country Network, Inc., publisher of Wine Country International® Magazine. 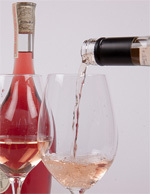 According to the network, rosés aren’t diluted red wines. They’re produced from the same grapes as more full-bodied reds, but the juice is only allowed to ferment with the grape skins for a few days, giving rosés their delicate pink color. Rosé brands participating include Ponzi Vineyards, Chêne Bleu, Presuqu’ile, Buglioni, Schramsberg, Scharffenberger and Henri Gaillard Rosé Côtes, Kim Crawford, Creekside Cellars. Celebrity hosts are Chef Hosea Rosenberg of Blackbelly Market and Restaurant, Madeleine de Jean (a/k/a Madame Champagne) and Barrie Lynn, The Cheese Impresario. Participating restaurants include Blackbelly, The Oceanaire Seafood Room and Big Mac and Little Lu’s. 100% of the auction proceeds will benefit There With Care®, which provides services to children and families during the critical phase of a medical crisis. Tickets are available online. It’s $65 for general admission and $95 for VIP.